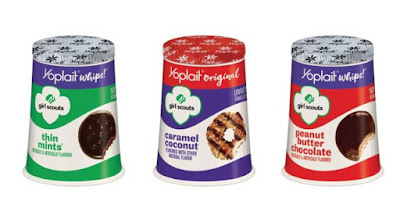 Arriving starting this month, you might find Yoplait Whips!Girl Scouts Thin Mints, Yoplait Whips Girl Scouts Peanut Butter Chocolate, and Yoplait Original Girl Scouts Caramel Coconut. The new flavors are a permanent addition to the Yoplait yogurt portfolio that will be available at retailers nationwide. Thin Mints and Peanut Butter Chocolate will come in 4-oz cups, while Caramel Coconut will come in 6-oz cups.